Snow World Escape info about the game-Games2Rule. 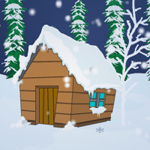 Snow World Escape is a type of point and click new escape game developed by games2rule.com . You're trapped in a Snow World. How your mind will work if you are really trapped in such a so cool place. Use presence of mind to utilize the objects found in the place to make an escape from there and go inside any house for surviving . Collect hearts for increasing your life span otherwise the game will be ended. Good luck and have fun!